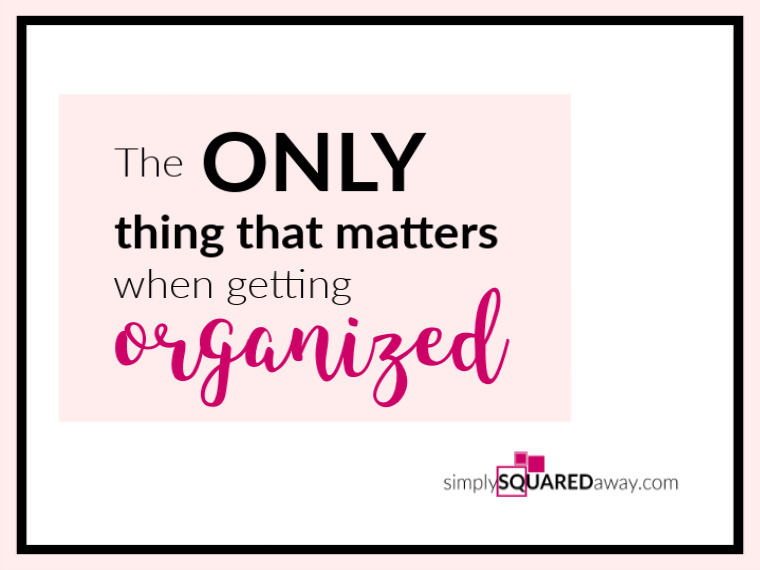 I’m sharing the ONLY thing that matters when getting organized…And it’s not what you might think. Take a minute to think about this. It’s kind of deep and unexpected so it might take more than a minute. HOW you get organized, the program or the steps, is not what will get you organized. You’ve probably been looking for the answer in the WAY to organize, HOW you do it, what the right decisions are or the right process is. But, I’m telling you today, it doesn’t matter. 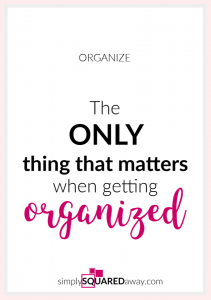 YOUR BELIEF ABOUT BEING ORGANIZED. 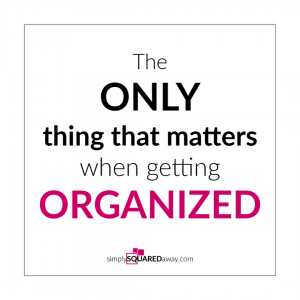 It’s the only thing that matters when getting organized. YOUR BELIEF. What if you believe that organizing is easy…instead of hard? 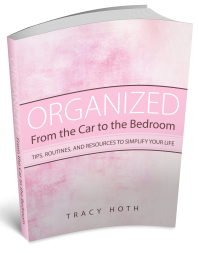 That you are (or are becoming) an organized person…instead of the messy one? That it is possible to keep your home organized...instead of impossible because your husband is a hoarder and your kids are slobs? What beliefs would you have to let go of in order to believe new things? That’s the part that requires the work…letting go of beliefs. This may be challenging because of confirmation bias. Your brain is GOING to PROVE that organizing is hard, you are messy (or your family is) and that it’s impossible and overwhelming to keep your home organized. That’s your story. You FIND all the evidence that your situation is unique and true, you are a special case, and it’s impossible, or at least much harder, for you to get organized. Right now you may not even realize it is a story. You think it’s “just the facts.” You think you’re just explaining your situation, right? We all do this. We just explain the “facts” to our friends. Then, friends typically agree with us and our story is reinforced. We continue on seeing all the evidence that this story is true. We’re overwhelmed by it all. That’s why coaching is so beneficial. I believe coaching is the most valuable use of your money. A coach helps you see these sentences in your brain. They help you see your story and they hold the space for you to discover and really understand what’s happening. They look at what your brain is doing, the thoughts it’s offering you, from a non-judgmental and unbiased point, and then help you see what it’s creating, the results you have in your life because of these thoughts. First, you have to see it. You have to see that these sentences are separate from your circumstances. Your circumstances, your situation, is NOT what’s causing your results, these sentences are. This takes time to sink in. Second, be willing to be wrong. Then, you have to be willing to be wrong. Willing to PROVE that your brain is wrong. You have to find evidence that contradicts your story. Just a minute ago I caught myself saying, “Oh my goodness, I haven’t gotten anything done today!” Stop it! I found the evidence, proving my thought wrong, by listing out what I had done: ran a mile, showered, got coffee, wrote this post, outlined an email, set up birthday plans with a friend, outlined and went live on Facebook, etc. And it was only noon! Why does my brain offer me the thought that I don’t get anything done? Why does your brain offer you the thought that you are disorganized? Prove it wrong! You have to create a new story. Practice your new story. Work up to believing your new story. Sentences in your brain have kept you disorganized. We have too much junk. I’m not good at making decisions. It’s impossible to keep my home organized. My husband is a slob. I’m emotionally attached to things. My home is too small, doesn’t have good storage space, is out of date. I love clothes too much. I don’t know what to do with things. It’s all connected to other areas and will take forever! What if you focused on discovering what these sentences are in your life? What if you practiced separating the sentences from your circumstances and seeing them for what they are? Just sentences. You would become a person who believed she was organized. That person would feel confident. That person would take action. Then, the HOW comes into play. Then the HOW can help. It may even be a combination of HOWs, or a creation of your own HOW. The result? An organized home! The most valuable investment is coaching. Investing in your brain, investing in coaching, is the most valuable thing you can do. Your brain is your most valuable asset. Invest in it. Take care of it. I know from my own experience, my own coaching that I pay for, that it’s the most valuable thing I do for myself. Try it out. 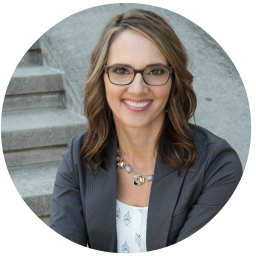 Sign up for a free mini coaching call by clicking here and choosing a time that works for you. Remember, the only thing that matters is your BELIEF about organizing. If you believe it’s hard, it’ll be hard. Impossible, it’ll be impossible. 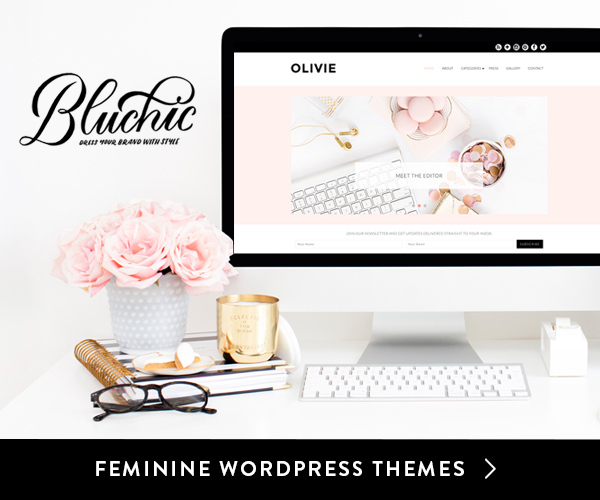 Don’t have time, you won’t have time to get organized. But, if you believe you are organized, it is possible and maybe even easy, your home will become organized because you’ll feel confident and actions come from confidence!